Are You a Business Owner or Advisor? Numerous surveys of small and midsize U.S. business owners confirm that their biggest challenges are inadequate growth of working capital, cash flow and profits. Click here for an instant estimate. See how much your business may be eligible for in hiring and employment tax credits with our instant and complimentary tax credit calculator. Tax professionals – click here. Insurance & financial planners – click here. Improve your value to clients by delivering risk-free working capital to improve their cash flow and open more doors to add new clients. Let us put our capital to work for your business, along with our proprietary software and over 15 years of specialized tax services expertise. 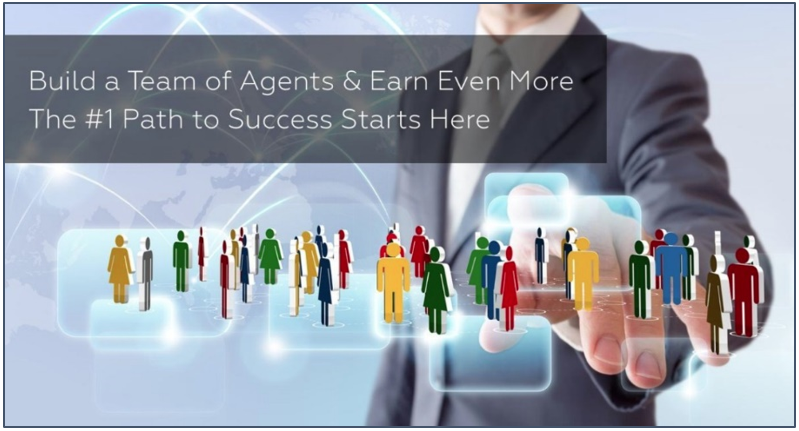 That’s what Keller Williams Commercial did when it chose Our “No Savings, No Fee” cost savings provider – Growth Management Group, or GMG – as its national preferred cost segregation provider. Medical Diagnostics, Inc. (MDI) – founded and taken public by Peak Profits Advisors’ John Lynch – was twice named a “Hot Growth Company” by Business Week magazine. Click the image above for an instant and complimentary estimate of your business savings. Click here to see how much your business can save in hiring tax credits alone. How are these cost-reduction services “risk-free”? Why isn’t my accountant providing these services for me now? Some of the larger accounting firms do provide some of these services, though not as comprehensively and not on a contingent fee basis. This means you could end up paying more in their fees than you save for your business. Most accountants, however, simply lack the specialized expertise – structural engineering. intellectual property law, etc. 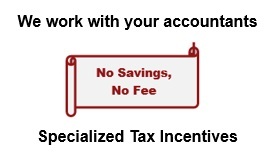 – required by the IRS to successfully claim these tax savings. Our work provides the necessary documentation for your accountant to file with the IRS or other taxing authority. How do I know these services are high quality and compliant with legal and regulatory requirements? In its 15+ years of performing these specialized tax services, our company has never had a single denial of savings it has documented for its clients. Our proprietary software incorporates industry best practices that optimize tax credits, refunds and deductions while conforming with relevant constraints, which is why we provide audit defense support at no additional cost if there were ever an audit of our work. This is also why we’ve been chosen as a national preferred provider by Keller Williams Commercial, the NFL Retired Players Association, many trade associations and accounting and financial services firms as their specialized tax services partner. Which of these cost saving services is most likely to help my business? 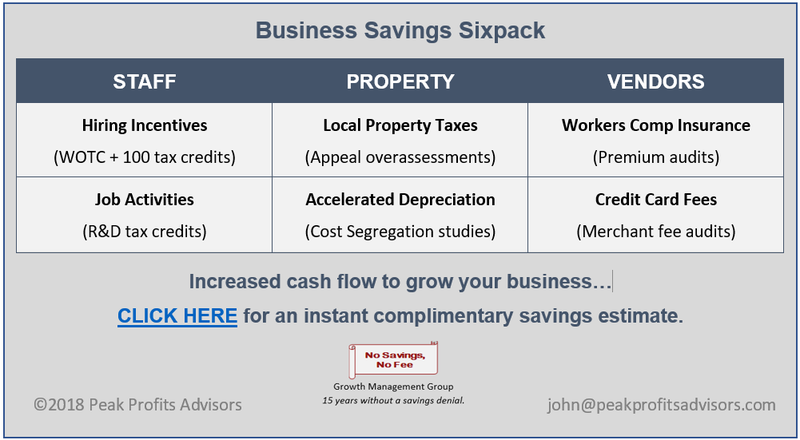 Most clients benefit from multiple savings opportunities, with hiring incentives like the Work Opportunity Tax Credit (WOTC) and credit card merchant fee and workers comp audits applicable to most businesses. Our typical client averages $240,000 in combined savings from three or more service categories, for over $4 billion in aggregate client savings to date. When you click on the above image and enter your industry and annual hiring experience, you’ll receive an initial estimate of your probable tax credit savings given our past experience with WOTC and other hiring incentives for your industry, as well as potential R&D tax credits depending on your industry. From there, we’re able to analyze your business for other potential savings opportunities you can pursue in whatever order you prefer. How do I get started to see how much my business may be eligible to receive? For a no-obligation initial estimate, simply click here. If you like what you see, click on the “Activate Now” button at the top of that page to get started. Or contact me to discuss how we can help you meet your business needs more cost-effectively.